The imagined scenario of Tabletop Cabaret: Hedgepig Races. Image by Justin Berry. BOTTOM LINE: An evening of accessible tabletop RPG fun with a few tunes thrown in for good measure. I have only played role-playing games a few times in my life, and those few times just happened to be at The Brick Theater. During the Williamsburg institution’s annual Game Play Festival, a night is set aside to indulge in Dungeons and Dragons, Call of Cthulu and other geeky classics. I was unable to make this year's tabletop night this past weekend, and I have not been able to indulge my role-playing hunger until just very recently thanks to another offering at Game Play. Tabletop Cabaret: Hedgepig Races is a fun, low stress introduction to the world of role-playing games fit to entertain leets and newbs alike. Developed by The Story Gym and presented as part of this year’s Game Play Festival, this show is actually an elaborately staged yet simply executed game that allows the audience to be an active participant in a story. The audience is greeted at each performance of Tabletop Cabaret by rows of tables with Game Masters seated at the head of each one. These affable hosts act as guides to the world of Tabletop Cabaret: assigning characters, explaining the rules, and leading the action along. Each GM helps put the audience at ease and invites them to enjoy the adventure that is to come. Furthering along the evening is mistress of ceremonies, Luna (a wonderfully campy Carlo Bosticco), who curates the Hedgepig Races, sings a few songs (wonderful ditties by Greg Moss) and sends you off on your journey. 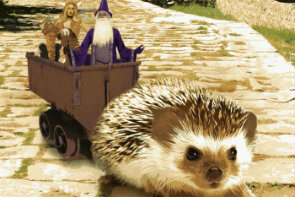 Soon, you and your teammates are off speeding through caverns in a wagon pulled by your chosen hedgepig (just like a hedgehog, only bigger) with danger lurking around every corner. To win the prize, you and your team must work together to overcome each obstacle. It's hard to categorize Tabletop Cabaret as a show, as much of the plot and action is within the game itself. The nature of RPGs leans a bit towards theatricality, though, and it makes sense to explore the medium as a theatrical device. Players must create characters, establish relationships and commit to their actions as any actor would. It’s very immersive and completely powered by imagination and decision-making. I brought a friend to Tabletop Caberet who had no experience with tabletop games at all, and she had a blast. Players quickly get caught up in the excitement of the race and the drama of each encounter and have a lot of fun playing the game. If you’ve ever been curious about tabletop games but have felt too intimidated or scared of making a commitment, give Tabletop Cabaret: Hedgepig Races a try. You’ll learn a little bit about gaming culture, make new friends, and have a little fun. There's also still time to check out the other offerings at Game Play this year, which I highly encourage you to do.